The first MOOC I ever took had 160,000 people signed up for it. The forums were buzzing with activity. New posts were being added every few minutes. If I had any question at all, it had already been asked and answered by someone else. But recently I have noticed forum activity and interactions in MOOCs have declined drastically. This is despite the MOOC user base doubling in 2015. The total number of students who have signed up for at least one course had crossed 35 million — up from an estimated 16–18 million in 2014 — according to data collected by Class Central (note: we will publish updated numbers soon). Scaling MOOCs required removing professors from the active role of running their courses. 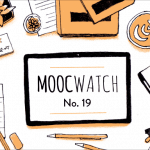 The first MOOCs were essentially college courses put online — they were approximately ten weeks long and had weekly or bi-weekly assignment deadlines with a final exam. Like a college course, they followed a semester pattern and were offered once or twice a year. But as course providers learned more about student behavior in online courses, MOOCs have evolved to meet the needs of the student. These needs include shorter courses with soft deadlines (i.e making it possible to submit assignments anytime before the end of the course, rather than having weekly hard deadlines). Kadenze, a MOOC platform optimized for arts education, made such a switch recently. After the switch, the platform got more submissions in one month than in the whole of 2015 (Kadenze launched in mid June 2015), according to CEO Ajay Kapur. Previously it was quite common to encounter a course you liked, only to discover it was already finished. MOOCs had no predictable schedule, and it was up to the university or professor to decide when the course would be offered again. So MOOCs are gradually being transformed from virtual classrooms to a Netflix-like experience. Most are now offered in a self-paced format or, in the case of Coursera courses, switched to a regular schedule, with new sessions starting automatically on a bi-weekly or monthly basis. If a student can’t finish a session, all their work is simply transferred to a new session. This has led to a significant increase in the number of courses students can register for and start almost immediately. Previously, when courses were offered once or twice a year, the students were all piled into one giant session. But now the same courses are available through the year and can be started immediately. This means that instead of tens of thousands of people learning together, everybody is learning at their own pace and in much smaller cohorts. The downside is that this has led to a drastic reduction in forum activity within MOOC cohorts. I recently finished a couple of machine learning (ML) courses on Coursera, which I thoroughly enjoyed, but the forum activity in these courses was, simply put, bleak. 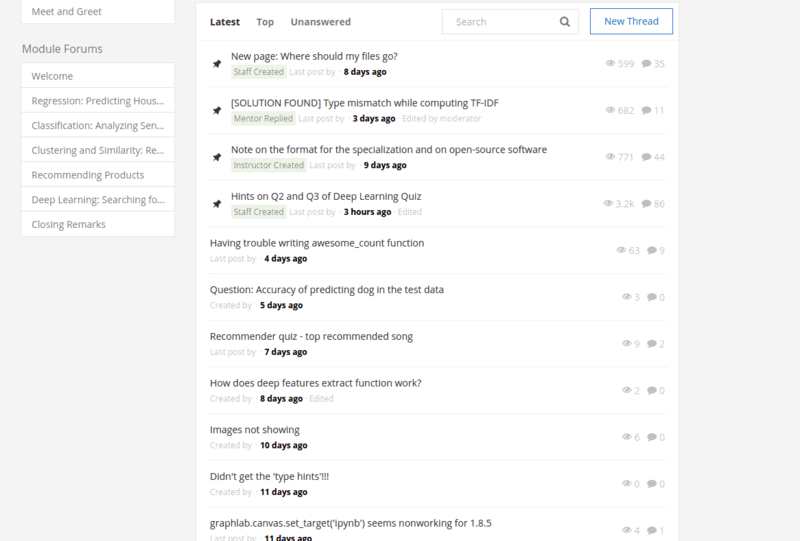 Above: screenshot of forums in Coursera ML class. There’s only been one post in the last 24 hours; every other post is more than three days old. At one point Coursera boasted about an average forum response time of 22 minutes; that’s no longer the case. This lack of activity isn’t true for all courses or all course providers, but there is a general trend in that direction. For example, while 40% of learners in FutureLearn MOOCs interact in their courses, less than 5% of learners tend to engage in Coursera MOOC forums, according to a study by Stanford. Fundamentally MOOCs as a format haven’t changed much over the last five years. What’s really changed is how they are packaged and promoted. 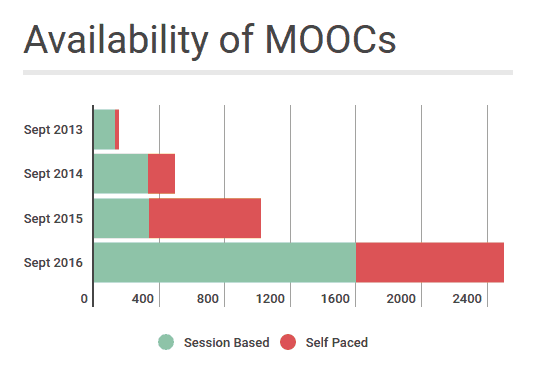 Part of this shift towards more availability is driven by MOOC business models. Having more courses available at any given time simply means more opportunities for people to pay for certificates, or for other additional services. Initially, everything was free. Content, assignments, and certificate — all free. But as MOOC providers started focusing on monetization, things went behind a paywall. Certificates were the first to go. In the case of many Coursera courses, even the graded assignments are now behind a paywall. EdX has had paid courses for a while now, and Coursera started experimenting with a few paid courses a couple of months ago. 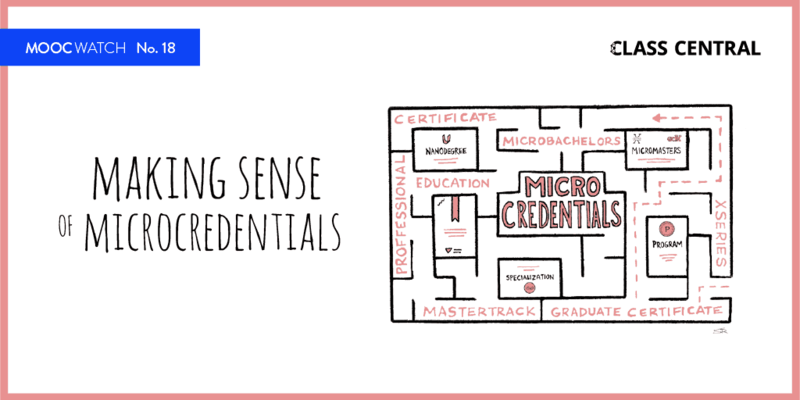 All the major MOOC providers have announced their own credential. Coursera has specializations. 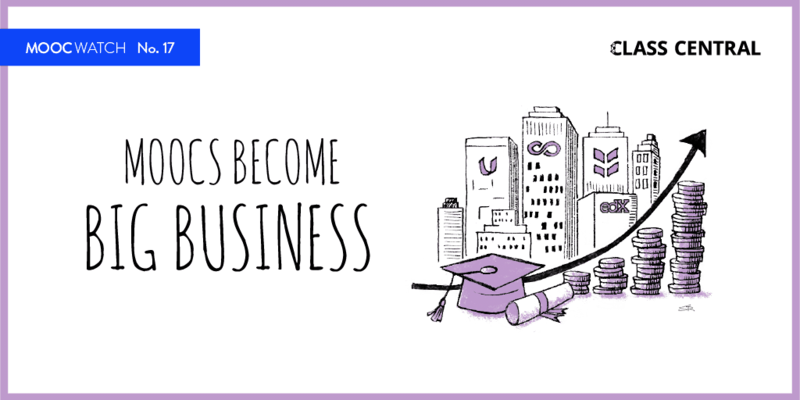 Udacity has Nanodegrees, edX has xSeries, and FutureLearn has Programs. And it’s clear lifelong learners are no longer the primary target. We still get to audit courses for free, but the real money lies in professional development courses. Above: a slide from the Coursera Partners Conference 2016, shared by online-education blogger Willem van Valkenburg. 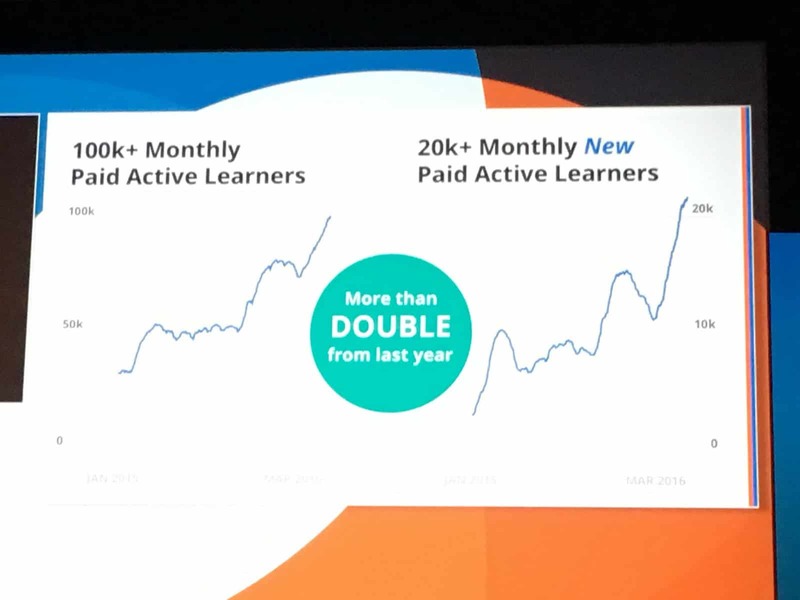 Overall it seems students have responded well to these changes, as can be seen in the chart above from Coursera’s partners conference earlier this year. Ideally it would be great to have increased availability AND social interaction. But it seems if we have to pick one, the paying learners would prefer to have courses available year round. I certainly prefer not having to worry about course start dates anymore. But I doubt if I will ever again get to be part of a class with over 100,000 people. 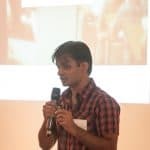 Dhawal Shah is founder and CEO of Class Central. He has completed around a dozen MOOCs and has written over 200 articles about the MOOC space, including contributions to TechCrunch, VentureBeat, EdSurge, Tech in Asia, and EdTechReview. This is true of so many courses on coursera that aren’t math based. Their only 5 or 10 students/session making communication impossible.